More info:Prices based on 2 adults sharing. From $940 - $1020 per child inc UK flights. Mimimum age 7. The caique used on this trip is one of just a handful still to be found in the Aegean and the family that we charter it from relies on us for their living. 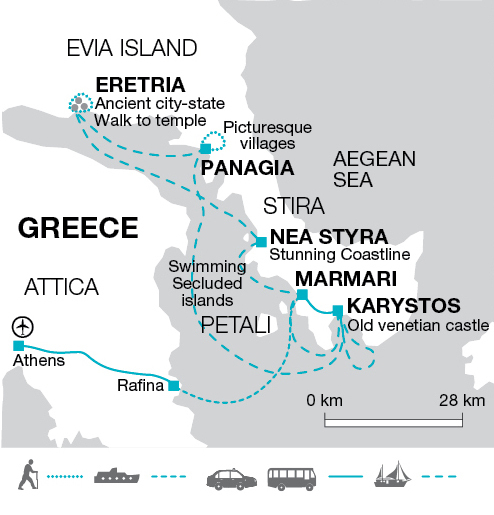 In addition, the nature of this sailing vacation is such that we visit many different communities on shore where we eat and drink, thus helping to generate an income for them in this quieter, less-touristy part of Greece. Using sails where possible helps save fuel – and reduces pollution, whilst exploration on shore is predominantly on foot – an environmentally friendly way of sightseeing.